**NOTE** -This must be done from a Windows machine. Apple Computers or Linux computers cannot perform this operation in the firmware updater. 1. Download the appropriate firmware for your NAS from our website (http://www.buffalotech.com/support/downloads) and the Nas Navigator (http://www.buffalotech.com/support/getfile/nasnavi-243wr.zip ). 2. Reboot your PC in to safe mode with networking. **NOTE**- Only do this step if you are having issues updating. This is to remove the possibility of firewalls, antivirus or any software preventing the firmware update from working. If you feel that this is not necessary you can try skipping this step. If it does not work then please try this. 3. **NOTE**- Only do this is if you are having issues updating while the unit is on the network. If having issues follow this to remove unit from the network. ** Set your computer’s IP address to a static IP address of 192.168.11.1 with subnet 255.255.255.0. A default gateway is not required nor is DNS. Attach unit to Pc via ethernet. NOTE: If you don’t know how to change your IP address on your computer you can find out how to do that for Windows (XP, Vista or 7). "C:/[Path to your Desktop]/[Your NAS firmware folder]/NASupdater.exe"
9. Boot unit while holding the reset button. 10. Run the shortcut and choose update. FINAL NOTE: Upon completing a firmware update you’ll want to restore the device to it’s factory defaults to remove any footprints from the previous firmware (same version or no). You can do this by logging in to the web interface, choosing maintenance, initialization and choose restore (does not delete data or shares). Download the firmware for your respective unit and the Nas Navigator (http://www.buffalotech.com/support/getfile/nasnavi-243wr.zip ). If you are unsure of your model then double check by posting on our forum. Extract the files on to your desktop. Open up the tsupdater.ini or lsupdater.ini file (You may not see the “ini” file extension. It’s file type is “Configuration File”.) The icon you see will look like one of the following. Name = "<Your Model number>"
6. Once these changes are made you’ll want to save the ini file. 9. 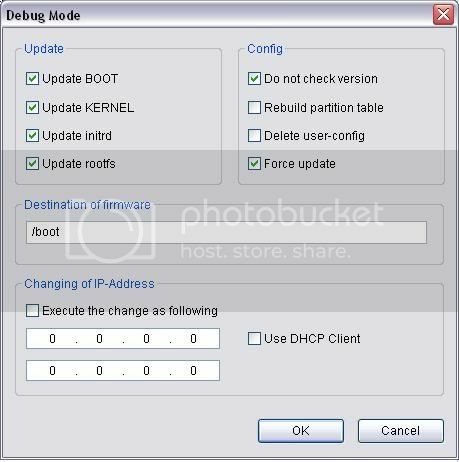 Make sure the options in your window are checked exactly as shown above **NOTE**: You can also choose “Delete User-Config” To restore settings on the unit through the updater. You can also choose “rebuild partition table” to completely format the unit during the update. If you wish to format and you have noformating = 1 in the .ini file, change the 1 to a 0. **NOTE** If you are having issues with the firmware update not finding the unit or you are getting errors please try these troubleshooting steps. 1. Boot your PC in to Safe Mode With Networking and attach the unit directly to your PC. This will prevent any firewalls, antivirus or softwares from preventing the updater from doing its job. Example: Updater cannot find the unit or pass authentication. 2. Hold the reset button while booting the unit which will boot the unit in to Emergency Mode (EM Mode). The reset button is on the back of the Linkstations and is behind the door underneath the LCD screen on the TeraStations. 3. When the unit boots (LinkStations – solid power light, TeraStations – When you see the host name of the unit) run the Nas Navigator. If the Nas Navigator cannot find the unit hold the reset button on the unit for 10 seconds and give it 1-2 minutes to reset. If the Nas Navigator finds the unit but the unit is at an IP other than 192.168.11.150, hold the reset button on the unit for 10 seconds and give it 1-2 minutes to reset. . Then set your computer’s IP address to a static IP address of 192.168.11.1 with subnet 255.255.255.0. A default gateway is not required nor is DNS. Attach unit to Pc via ethernet. The unit should NOTE: If you don’t know how to change your IP address on your computer you can find out how to do that for Windows (XP, Vista or 7). The Nas Navigator should now find the unit at 192.168.11.150. If the unit continues to receive 169.254.x.x address then simply set your PC’s IP to a similar 169.254.<“same # here”>.X address. 4. Perform regular steps to continue flashing firmware. If the Nas Navigator cannot find the unit, make sure to change out the Ethernet cable, make sure the Ethernet port on your Pc is enabled, try another Ethernet port or try a different computer.